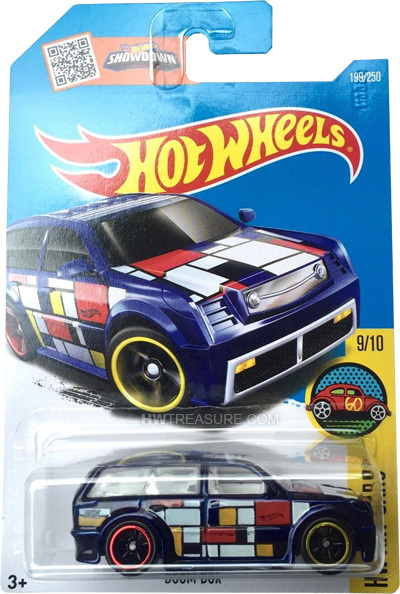 199/250 is part of the 2016 Super Treasure Hunt set and 9/10 in the HW Art Cars series. The Spectraflame blue SUV is decorated with the letter “a” on the roof and a pattern of white, red, and yellow rectangular graphics on the hood and sides. The sides also have “TH” and the Hot Wheels logo. The windows are clear with the Hot Wheels logo etched on the rear window. It has a white interior, a black plastic Malaysia base, and Real Rider wheels with yellow rims in front and red rims in back. 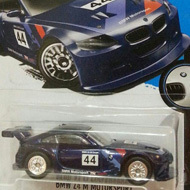 This vehicle can be found in mix “L” of 2016 Hot Wheels mainline cases. The Boom Box made its debut in the 2003 First Editions series. It is a unique design of a lowrider SUV.